Every first-time entrepreneur needs a boost once in a while when they are in the thick of things. As a company that has been running for the past three years in a relatively new industry, we’ve had hurdles that we’ve overcome and are gladly willing to talk to you about it. This sounds like an oxymoron, but engaging with the competition in one way or another is not the worst thing that you can do. We’ve been taught that it is a cutthroat society when it comes to business but it need not be the case. 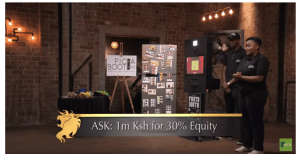 Photo booth in Kenya is a fairly new concept, and the industry is young. Helping each other out (note: not giving each other trade secrets) is the difference between having an industry that more consumers embrace and having apprehension at the concept of having more than a photographer added to an event budget. We all at one point or another have people who treated our hustle as though it was less than because of the size of its early stages. If we were to have an Entrepreneur Anonymous group, we would all admit about the time that someone missed our order or simply said we could not afford them because we were just starting out. That is normal, and you need not take it like the worst thing that ever happened to you. Everyone in these streets of Nairobi is trying to make it, and it would make sense why people choose the path they do. Do not take offense, merely learn. You ain’t gonna give up! Picha Booth is here to tell you that you’re not alone. While it might feel intimidating (or plain rude) that someone would dismiss you, as with everything in business, treat it as a lesson. Those who do not wish to work with you push you to seek out people that align with your values. They might not work for huge corporates, but they are honest and hardworking in what they do. At the end of the day, more people are willing to support you than you think. There will be days you wished that you didn’t quit your day job. The assurance of having a monthly salary is gone, and you’re likely left wishing you could turn back time. The beginning might be slow but, if Picha booth has taught us anything, keep at it. If you believe in what you’re doing and your work leads to a greater good, your hard work will bear fruits. These are just a few things we’ve learned as Picha Booth. What has been your experience? Let us know in the comments section. PS: Make sure you attend this upcoming Masterclass on Entrepreneurship by Simon Page College of Marketing on Thursday, 30th August @KeMU Towers, 8th Floor.